I’ve been able to do a little book reading this summer — not as much as I’d like but I’m grateful for some time to read. I recently finished a book by a debut author, and I thought I’d share it with you. I’d read a little bit of Kara Isaac before she was published, in a writing contest, and loved her voice and style. That was a different story than this one, but when I saw she had a book coming out, I put it on my must-buy list. Close to You was a fun read for a lot of reasons. I’m not a Lord of the Rings fan, necessarily, but I liked the concept of people visiting New Zealand to see places where the movies were filmed. If you haven’t seen them, the real-life settings there are gorgeous. And I thought the idea of having a woman find out her husband was already married was a new one. Unique. I wanted to see how that played out. Then there was Jackson, the hero. What I loved about him was that he was all male. He wasn’t a sugar-coated, too-good-to-be-true character. He and Allison didn’t like each other. At all. And that came through from his point of view very well. At the same time, though, he was a good guy who could put feelings aside and do what was right. A good guy who might need a few knocks across the head, yet was coming around as I read. And it was fun to see him grow and see the relationship between Jackson and Allison change. The whole cast of the tour group added a fun element to the book too, with each member contributing their own shenanigans. And then came the ending, which wasn’t what I expected it to be but was very satisfying. Close to You had wonderful comedic moments and plenty of sweet romantic moments as well. It’s a well-written, believable story about two people who have choices they need to deal with and move beyond. And I think a lot of us relate to that. Fans of Christina Coryell will love Kara Isaac. Has anyone read Close to You? What were your thoughts? No spoilers please! Thanks for the review, Sally. I’ve got Kara’s book on my Kindle, along with millions of others. :) I’m looking forward to reading it. Hope you enjoy it, Jill! Yay, Wemble! Thank you for letting me know that. It was fun to get back to the Kept characters. So you’re a local! Well, that makes flying much easier, doesn’t it? :) I flew 11 hours to Brazil once. That was not pleasant! I’d love to visit your part of the world, but not sure I could do it without stretching out in first class. My legs would swell so much! I have never read a book by this author. Thanks for introducing the author’s work. Kaleen, you’re welcome! Hope you enjoy it. This book sounds great-New Zealand and Lord of the Rings and a handsome, caring man. I’m ready to start a new book. LOL, yes, a recipe for a must-read, right? I have not read this book but it sounds like a fun read. Thanks for the review. I am always looking for new authors! You’re welcome, Beth. I loooove trying new authors too. Very fun! I hadn’t heard of this book or author. I will look her book up. 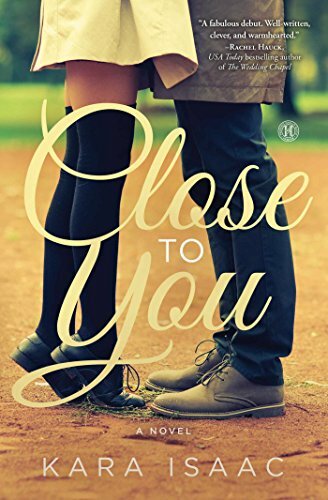 I’ve read Close to You and absolutely adored it! It was such an original premise and setting and so much fun! There were several places I was laughing out loud. I’m looking forward so much to her new book coming out this fall, Can’t Help Falling. Kara is a wonderful author! I agree, Winnie! We always hear from publishers how readers don’t want foreign settings, but I found it very refreshing. And I’m looking forward to Kara’s next book too! Thanks for recommending this book. The story is intriguing. I’m not a Lord of the Rings fan either, but I’m pretty sure New Zealand’s scenario is amazing anyway. A friend just came back from visiting it and his pictures were breathtaking. I felt like none of it was real, but a painting of God’s amazing work. That’s a great way to describe it, Priscila! I’d love to visit. I guess it has no predators. No poisonous snakes, bears, etc. Sounds like heaven, doesn’t it? I’m in the midst of reading CLOSE TO YOU. It’s nearing the end of the tour, so just a few chapters left. I’m still uncertain how it all will be resolved. There are some very funny scenes in this book. I like the way we see things from Allie’s point of view and then switch to Jackson’s. I’d be as lost as Jackson on a tour like this. I’m going to give the book to my daughter when I’m finished since she is a big Tolkien fan. It’s so fun to hear people’s thoughts while they’re reading it. :) There are some funny scenes. The one that sticks with me might be the mud pit. What a mess! That mud scene was hilarious. I could just picture it happening in my mind. Loved it! Yep! I was glad it wasn’t me in that pit. Nasty! Oh, I’d forgotten about this one!! It needs to be on my future TBR pile just for the fact that they feature both New Zealand and the Lord of the Rings tour. I am a huge fan of both!! :-) I think it would be fun someday to visit where the movies were filmed, and take a side-trip to see my mom who lives in NZ! Sounds just like a story I’d really enjoy reading! Thanks for the fun review Sally! Oh my goodness, Trixi! Read this one next! You’ll love it. I enjoyed Close to You – partly because it’s one of the first Christian novels I’ve read set near where I live (yes, I live in New Zealand, a short drive from Hobbiton). It was a great story, and I absolutely recommend it for fans of contemporary Christian fiction. Isn’t it nice to find a story set where you live? Even for me, that’s a rarity. In my country, yes. In a city? Not very much. :) Thanks, Iola!